Once upon a time there was a road race from Beverley to Perth. It started way back in 1897 and ran until 1999, and was considered one of the toughest races in Australia. Back in the day, the roads were gravel and the bikes were steel. Nowadays, the Beverley Heroic weekend celebrates this race and all things vintage, with a weekend of cycling and history. On the Saturday, there is a road race and a cyclocross race. On the Sunday, it is all about the recreational rides, with the long 100 mile (160km) heroic, a shorter 50 mile (80 km) and a Beverley town ride. This was my first year doing the heroic – and I had opted to do the cyclocross race and the 100 mile heroic. The cyclocross course was set up around the Beverley sports oval and incorporated a small mountain bike pump track plus some gravel roads. It was atypical for a cyclocross course, because it didn’t have (as) much hard pedalling, grass, deceleration for corners and acceleration as a normal circuit. 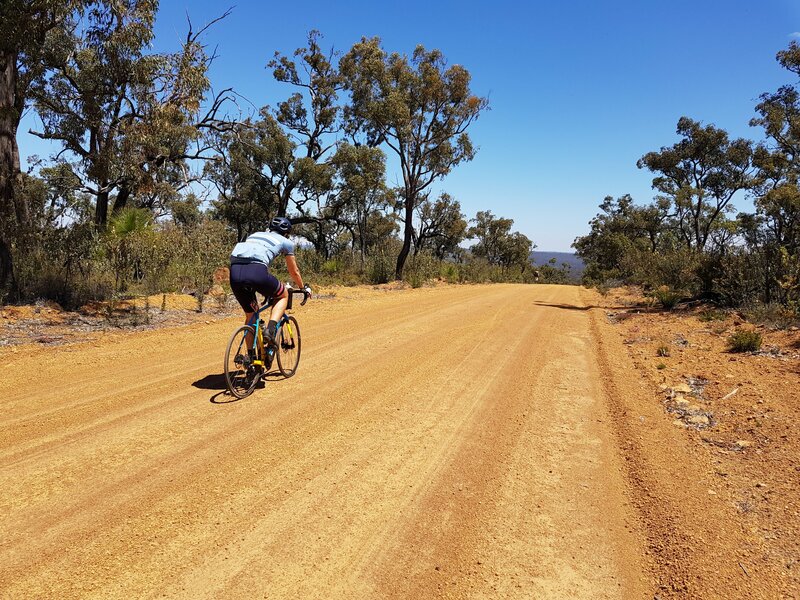 It was more like a mountain bike course – with half the course comprised of long flat gravel and grass sections, and half the course comprised of the mountain bike pump track – which was all up and down and not much pedalling. In a normal cyclocross race, I will spend 95% or more of the time in heart rate zone 5, which is the highest heart rate zone. This is because all the accelerations and decelerations mean there is bugger all time to catch my breath. In contrast, for this race I spent only 10% of the time in heart rate zone 5, and 75% in heart rate zone 4. In between the long gravel road sections, the non-pedalling mountain bike sections, and the highly technical slippery gravel corners, I got plenty of recovery time and my heart rate was way lower than normal! Due to the small field, all the cyclocross racers started en masse – there were about twenty of us. Because I had helped in the course setup, I was called to the front of the starting grid, which suited me because I have a pretty handy sprint on me. Not so handy when I’m sprinting against guys though! So we took off, and about half a dozen people got in front of me as we headed into the first corner. We then formed a line through the next technical section of the course, and very quickly sorted out who was faster than who. One of the other women (Dahlia) was in front of me, but she lost traction on a corner and skidded off her bike. I just managed to get around her rather than over her, but it left a little gap in front. So I had a bit of space in front of me, and I knew I still had a bunch of guys behind me. This suited me well, as I had done a good course recon and I knew what was coming up in the mountain bike pump track. Unfortunately for the guys behind me, they didn’t know that I was going to come to a complete standstill at the top of one section of the track followed by a downhill and a steep uphill. I had scoped this out in my warmup and knew I didn’t have the skills/guts to ride up the uphill, so I stopped to dismount and do it on foot. This then brought down a few of the guys who were right on my wheel and had to stop themselves. Sorry guys! I was super happy that I got through the rest of the mountain bike pump track, which included tricky obstacles like a really steep downhill ramp (which I nailed every time), some large ditches that were just begging to throw you off your bike, and narrow paths between trees tackled at speed (not my favourite thing). After the mountain bike section, there was a massive log to jump over, a tough skidding sandy section, some grassy corners, and right near the spectator area was a technical section full of corners on loose gravel. You had to take it really slowly through there to stay upright! In my experience, cyclocross races end up being quite an individual event, with you going as hard as you can and trying to either catch the person in front of you, or stay in front of the person behind you. As I am racing, I tend to form an idea of what my “superpower” is in that race – what am I doing better than the people I’m racing against. For the Beverley cyclocross, I decided that my best superpower would be staying upright and not coming off my bike. I had seen Dahlia come off in front of me, plus several guys with dirt all down their jerseys, and two guys walking with their bikes, presumably after having some kind of mechanical. I had a few close calls myself on the slippery gravel, which had a layer of tiny nuts and twigs over the top of it, making it very unpredictable. But thanks to my superpower, I stayed upright and finished in a good position. I was also super impressed with my barrier jumping in this race. Normally when I get to the barriers, I jump off my bike but then walk over the barriers, afraid that I’ll trip if I try anything fancy like hurdling. My excuse has been that my legs are short and the barriers are almost as high as my knees. Somehow, for this race, I just jumped over the barriers like a gazelle, like I see the guys doing and think “gosh if only I had longer legs”. Well, turns out I don’t need longer legs! I am not sure how or why I managed this feat of gracefulness and athleticism but I intend to keep it up! I was super happy with my skill progression both for cyclocross (graceful gazelle barrier jumping) and mountain bike (getting through the obstacles in the mountain bike park that normally I would balk at even on a mountain bike). It was also fun racing in the late afternoon, particularly after the road race was staged in the heat of the day. The Heroic started in Beverly around 6:30am with a mass roll-out. There were 47 riders registered for the 100 mile Heroic, so it was a good sized group. We mostly stayed together for the first 5 km or so until we turned off to the Top Beverly-York Rd. This road was quite undulating, and quickly sorted us out into small groups of similar ability. I had intended to ride with my little posse of five riders until we got to York, but Karen and Sue had dropped off the back of the peloton within the fist 5 km and they were nowhere to be seen, so we quickly realised we wouldn’t be riding with them today! However, Greg, Annie and I stayed together in a small bunch with a few other riders. My biggest problem until we got to York was that the coffee I’d had with breakfast had gone straight to my bladder and I really needed to pee! There were absolutely not enough trees for shelter on the side of the road, so I counted down the 30 kilometres to York and tried to focus on maintaining bladder control without getting stomach cramps. Finally we reached York, toilets, and the first check point. Relief! 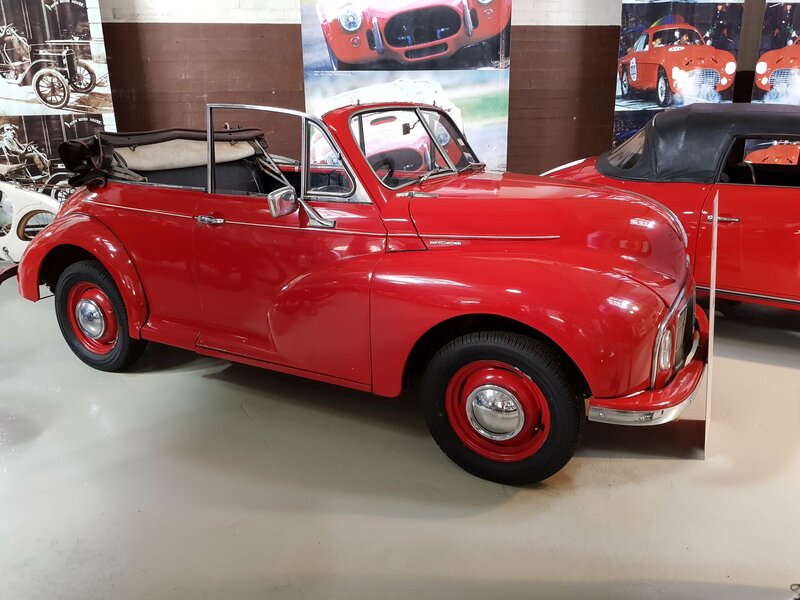 We also had a look through the historical motor museum. As we were getting ready to get back on our bikes, Karen and Sue rolled up. Karen was clearly in a lot of pain with her lower back so I gave her my supply of pain killers to hopefully get her through the day. Fingers crossed my own lower back would hold out! Departing York, we headed north to the next checkpoint at York Sky Dive. We had a little group of five riders, so we shared the work among us, taking turns on the front. After the check point and about 20 km north of York, we turned off Spencers Brook Rd and onto our first secteur of gravel. The gravel surface wasn’t too bad, but it was pretty steady climbing for about 10 km. This is where our group got whittled down to three, then two after Greg also dropped off. We were not going crazy hard, just taking it at a good steady pace. We got back on the bitumen, then after a little while we saw Greg behind us, so we eased up so he could catch up (turns out he’d had a nature break). Back on the bitumen on Mokine Rd, there was a super fun downhill section, which was stopped short due to a right hand turn – taking us back uphill. By this time, the smokey fog that had obscured the sun in the early morning had cleared, and the heat was starting to bite. It was not yet 10am. Our reward for the tough climb was reaching the York Olive Oil Company, where a croissant and coffee brunch was supplied as part of the ride. I also enjoyed the chance to catch up with some of my buddies who were volunteering, or doing the 50 mile ride. Get those croissants in ya! We spent 45 min at this stop, enjoying the shade, food and camaraderie. Finally we decided it was time to make a move – our little trio set off for the next leg. We headed south, did a short section on Great Northern Highway, then turned left onto Helena Road. This was the next gravel secteur, and it was a long one – 20 km for this section. 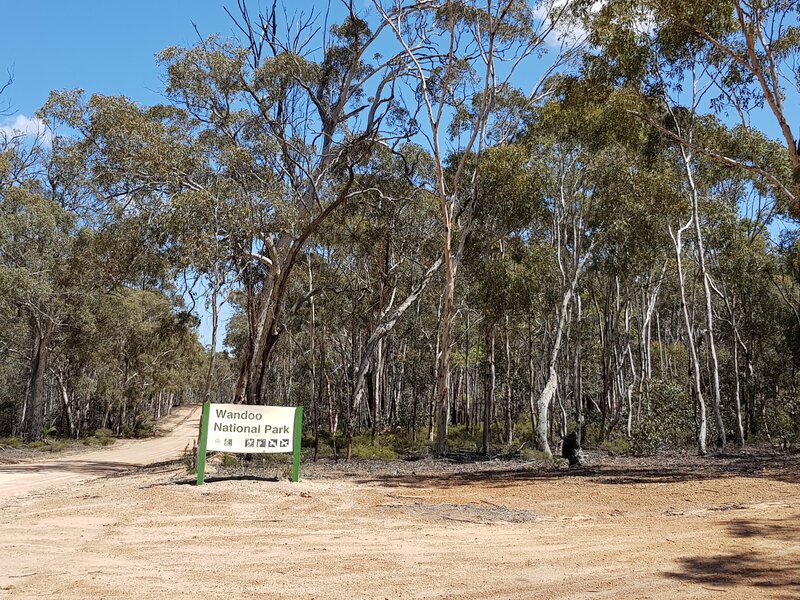 It went through Wandoo National Park, undulating but not too serious. The gravel was quite good for riding, reasonably solid under tyre. At the end of Helena Rd, we turned left onto Talbot Rd West, which was bitumen. We knew this was the road back to Beverley, and assumed we would follow it the rest of the way. At this point we had done 100 km, with about 30 km of gravel. We were starting to feel the distance, with complaints of sore bums and just not being able to push to hold the wheel. I decided it was time for a rest break – but first I had to catch up to Greg who was about 20 m in front and tell him we were stopping! We had a 10 min rest, enough to stretch the body and have a snack, then back on the bikes and on the road. About 7 km later, we saw signs that there was a cafe a few kilometres away. We knew there was one more official rest stop, and we figured it would be at the cafe. But we got there, turned left, and there were no signs to pull into the cafe. We all had enough water so we pushed on, up a bitumen hill (Qualen West Rd) then a right turn onto Sandgate Rd, which was the final gravel secteur. The name of the road should have been an indication of what we were in for. Sandgate Rd was the roughest section of gravel for the whole ride. It was a bit rocky/gravelly, as it had recently been graded which had brought some of the coarse gravel to the surface. Then there were the sandy bits. They started out ok, rideable, and there was a firm line somewhere. But as the road continued, the sandy bits got boggier and there was no good line, even on my cyclocross bike I was losing traction. I tried to go slowly through this section so that the other guys could follow my line, and I was purposely trying to pick the best line for them. Then I looked back and no one was in sight. It seemed that my cyclocross bike and tyres had finally come into their own! Greg was on a cyclocross bike, but he had 25mm road tyres, whereas I had 33mm off-road kobbly tyres. And Annie was on a road bike with 25mm tyres. 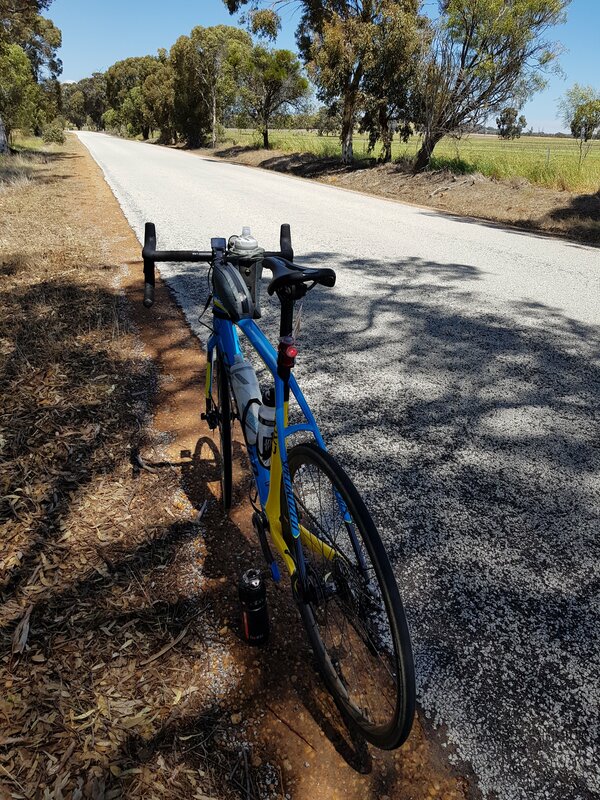 Plus she had something wrong with the hub or freewheel on her rear wheel, so every time she tried to freewheel, the hub locked up and let out a screeching sound – so she did the whole 160 km pedalling almost all the way. Sandgate Road was only 10 km, but it took me 30 min and I then waited about four minutes for the other two to catch up. We headed over the railway line and finally reached the last checkin point! They had large eskies full of ice and cold water, plus apples cut up with caramel topping – it sounds weird, but it was really good! I had been feeling like I’d need to eat something, so this went down well. Then Annie discovered she had a flat tyre – must’ve been from Sandgate Rd. Good thing she found it here, as we could rest in the shade with iced water while one of the lovely volunteers changed her tyre. This stop was about 20 min, then we were off for the final 23 km. We had been averaging about 23 kph, so only one more hour to go, and it was all on bitumen. However, after about 15 min I realised I was reaching the end of my glycogen stores. I thought I should be okay as I was riding well below threshold, and I was reasonably well adapted to fat-burning. So I figured I would just keep riding at a steady pace and my body should kick into fat-burning mode and I would get through. But I could feel the goosebumps starting and my hearing shutting off as my brain went into survival mode. I was sitting behind Greg and Annie as they were riding and chatting, but I couldn’t hear or care what they were saying. Then Greg asked me if I was okay, and I replied “no, not really, I think I should have something to eat”. I must’ve looked pretty bad, as they stopped straightaway under the nearest tree. I got out a slice of paleo bread (made with almond meal, egg, grated veggies and cheese) and scoffed it down. I was super impressed that it had survived the heat in my pocked, it wasn’t smushed to pieces and it tasted great! After a 5 min stop and one slice of my paleo bread, I was good to go again. I was so pleased I’d stopped as there were a few more climbs to go, and I didn’t think I’d have gotten over them without some more energy. Down to the last 12 km. Over the climbs, Greg and Annie were faster than me, which I attributed to my off-road tyres slowing me down. Admittedly, my power up the climbs wasn’t as high as it had been for the first 50 km, but after I’d had my last food stop I was feeling okay. In a cruel twist, we reached Beverley and could see the finish line at the town hall, then the course took us on one more circuit of the town so that we got the total distance of 160 km (100 mile). All up, my ride took 6:50 (excluding long stops were I stopped by Garmin). We averaged 23.4 kph. I burnt 3,160 kJ with normalised power of 155 W. My heart rate never once reached threshold. And my average cadence was 88 rpm. I would be interested to see how many of the 47 registered riders completed the 100 mile Heroic. I know that some pulled out before the day of the event, and some decided (after doing the road race the day before) that the 50 mile event would be a better idea. I also know that some riders started off doing the 100 mile, but took the opportunity after York Olive Oil Company to veer onto the 50 mile course. And there were riders who didn’t complete the event, getting collected by the sag wagon. So it was a big achievement for everyone who did complete the 100 mile Heroic in unseasonably hot conditions. I started the day with a breakfast of nut-based muesli, milk and stewed fruit, with a 300mL iced coffee (just milk and caffeine, no sugar). At York, I had some date and nut balls. Then at the York Olive Oil Company brunch stop, I had three croissants (one chocolate, two plain) and a large milky hot coffee. At our short stop on Talbot Rd West, I had the remaining date and nut ball (that was four in total) and some cold black tea – just tea, no sugar or milk. At the final rest stop, I had a full bottle of iced water plus an apple with caramel topping. Then on my emergency stop I had one slice of paleo bread. In my water bottles, I had just water, and two bottles had added sea salt for electrolyte replacement. At the finish, we had been promised a lavish afternoon tea. Unfortunately, by the time we arrived at 3pm it had been packed up, and the few items remaining (packed into plastic containers) were cakes (full of gluten and dairy and sugar) and mini pizzas (full of gluten and dry and tasteless). I had my remaining piece of paleo bread, tried one of the mini pizzas, and had a not very nice piece of cake. And a cup of tea. Well, that was that. My next food intake was a glass of milk when I got home about two hours later. I had been a bit disappointed that I’d reached the stage of bonking towards the end of the ride, but on reflection I didn’t eat all that much and certainly not that much sugar throughout the day, which was the plan for a long low-intensity ride. I was pleased not to be crazy hungry after the ride, and I didn’t get any issues with cramps during or after the ride, in spite of the very hot day. I was hungry in the two days after the ride, having approximately three breakfasts on Tuesday morning! All in all, I would say that my nutrition was a success for the ride. 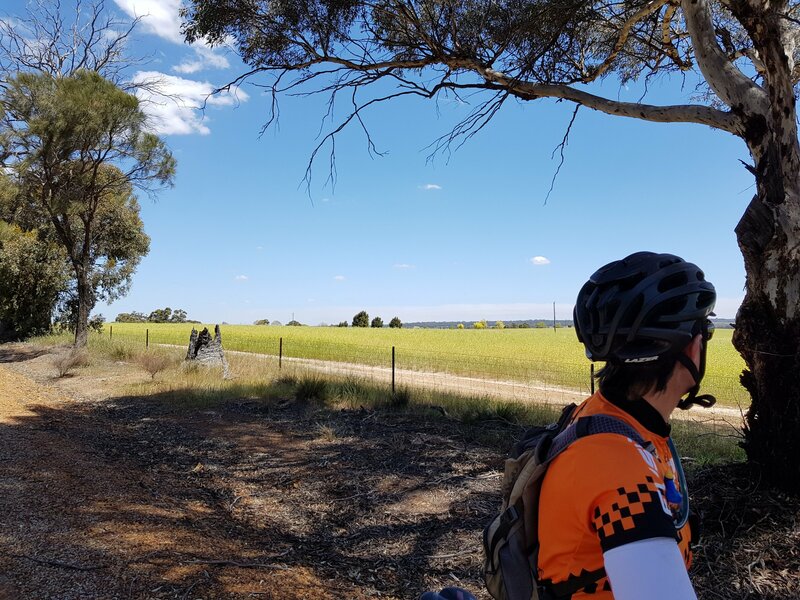 The information on the website and in the rider guide led me to believe that the ride was self-supported, and water and food would be available only in York, which was 35km into a 160km ride. Yes, they said there would be food at the York Olive Oil Company – which is practically in York. I hadn’t realised that we would be doing a 50km loop and coming back to York. This could be made more clear by putting the distance (kilometres or miles) where the food/water/checkin points would be located. It was disappointing that the grand finale afternoon tea and Hall were mostly packed up (with packing up continuing) when we finished. I appreciate that everyone wants to get home, but for a ride that prides itself on participation, it would be nice to recognise the riders that don’t finish in a speedy time. On the plus side, the volunteers were awesome, and the rest stops and food and ice were very much appreciated. 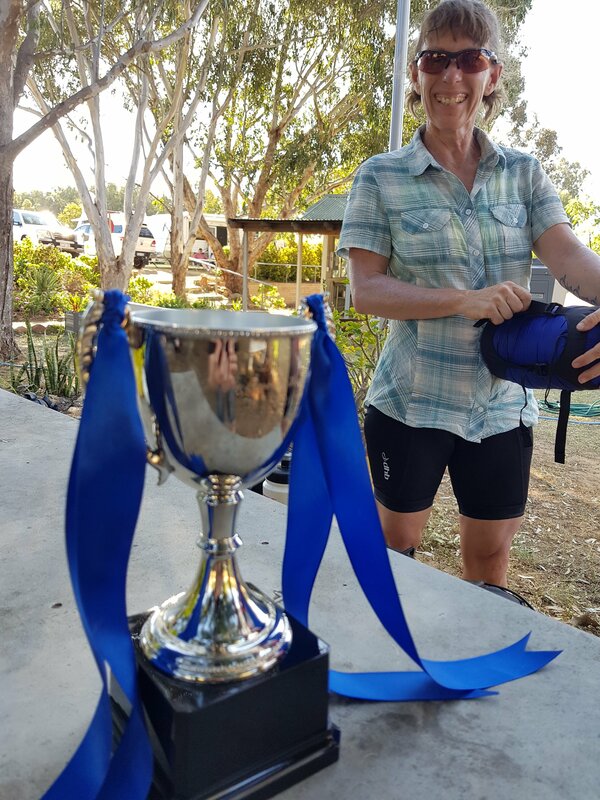 It was also very well done to award the Heroine Trophy to Karen for her heroic efforts in completing three 100km+ rides in three days all over 30 degrees, including her first ever road race and the full 100 mile Heroic – recognising achievements that don’t relate to going fast or being first is a valuable thing. I love an event that doesn’t even have electronic timing! Karen, Heroine of the weekend. I was super impressed with her mental and physical resilience to complete all three rides this weekend – the so-called Beverley Trilogy. I approached it with no expectations, no goals, an attitude of just ride and see what pans out. My body didn’t get sore, in particular my lower back, which I attribute to the more relaxed bike position on the cyclocross bike and the excellent bike fit (thanks Mark at Midland Cycles). The terrain was varying, up and down but not crazy hard hills, and gravel. This kept it interesting. I really don’t like flat long rides as I find them tedious and my body does get sore from not changing position. I was riding with two great buddies and we were well matched in ability. The food/rest stops were relaxing, you were encouraged to stop and chat with other riders, and the food was real food, not sports nutrition from a sponsor. There was no pressure to finish within a particular time or race for a good position. In fact, it is not even possible to find out how you compared to other people as there are no published results and no timing chips. If you are looking for a fun day out on your bike, put the Beverley Heroic in your calendar for next year. You could do the full 100 mile, the 50 mile, or even the short town ride, and you will experience good country hospitality and the pleasure of riding your bike just to play. Tagged course analysis, cyclocross, gravel, micro-adventure, off-road, recreational.